Additional playboards available for $50 ea. 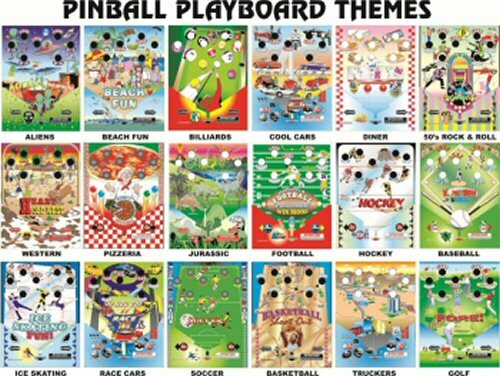 The Playmore-Winmore Pinball Machine combines the best traditions of both pinball & bulk vending in an interactive game of skill. Plays like a traditional pinball machine with side flippers and ball shooter. Three balls are released and the fun begins! The theme-based playing field includes four "Win" holes and three "Lose" holes. Relying on mechanical movement without electricity, a turn of the coin slot drops three gumballs into play. A player uses two spring-loaded flippers to knock each gumball into one of the game's plungers. Successful scores deposit winnings via the flip-up candy door while losing gumballs are held in a container for later refilling of the hopper. Super heavy duty construction is designed to last through energetic game play. All mechanical function allows for placement anywhere. 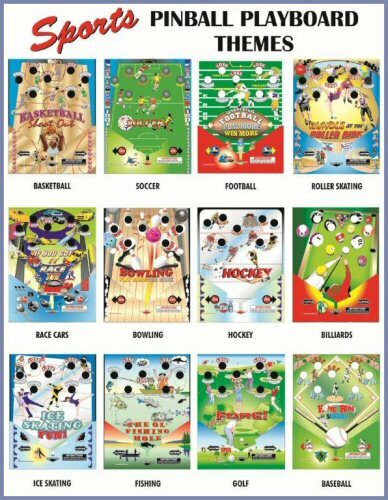 Additional sports and location themed playboards are available and can easily be changed. Great addition to you personal family or game room. Popular in Bowling Alleys, Family Restaurants, Sports Bars, Pizzerias, Bar & Grills, Arcades, Movie Theaters, Amusement Parks, Campgrounds, Family Entertainment Centers, Laundromats, Travel Stations, Big Box Retailers, Traditional and Non-traditional Crane Locations and many more, just to name a few! Made in USA. Replacement parts easily available. One year parts and labor warrantee against manufacturer defects under normal working conditions and ordinary wear and tear.